The Lost Weekend is a 1945 American film noir directed by Billy Wilder and starring Ray Milland and Jane Wyman. The film was based on Charles R. Jackson's 1944 novel of the same name about an alcoholic writer. The film was nominated for seven Academy Awards and won four: Best Picture, Best Director, Best Actor, and Best Writing (Adapted Screenplay). In 2011, The Lost Weekend was added to the National Film Registry of the Library of Congress as being "culturally, historically, or aesthetically significant." Thursday - An alcoholic New York writer, Don Birnam (Ray Milland), is packing for a weekend vacation with his brother Wick (Philip Terry), who is trying to discourage his drinking. When Don’s girlfriend Helen (Jane Wyman) comes to see them off, she mentions in passing that she has two tickets for a concert, to which Don urges Wick to accompany her. Don heads for Nat’s Bar, deliberately missing his train, and then sneaks back into the flat to drink some cheap whisky he has bought, avoiding Helen who is worried about him being left alone. Friday - Back at the bar, the owner, Nat (Howard Da Silva), criticizes Don for treating Helen so badly, and Don recalls how he first met her. It was due to a mix-up of cloakroom tickets at the opera-house, where he had to wait for the person who had been given his coat-check in error. This was Helen, with whom he strikes up a romance. When he is due to meet her parents for lunch at a hotel, he loses his nerve and phones a message to her, crying off. Presently he confesses to her that he is two people ‘Don the writer’, who can only write while drunk, and ‘Don the drunk’ who always has to be bailed out by his brother. Still, Helen devotes herself to helping him in his plight. Back in the present day, Don has moved on to another bar, where he is caught stealing money from a woman's purse to pay his bill, and he is subsequently thrown out. In the flat, he finds a bottle he had stashed the previous night and drinks himself into a stupor. Saturday - Don is broke and all the pawnshops are closed for Yom Kippur. At Nat’s Bar, he is refused service. In desperation, he visits a girl who had given up on him because he kept letting her down, but now agrees to give him a few dollars out of pity. Leaving her flat, he falls down the stairs and is knocked unconscious. Sunday - Don wakes up in an alcoholics’ ward where 'Bim' Nolan (Frank Faylen), a cynical male nurse, mocks him and other guests at ‘Hangover Plaza’, but offers to help cure his delirium. Don refuses help, and succeeds in escaping from the ward while the staff are occupied with a violent patient. Monday - Still broke, Don steals a bottle of whisky from a store, and spends the day drinking and hallucinating. Helen returns, alerted by a call from Don's landlady who can hear his screams. Finding him in a delirious state, she vows to look after him and spends the night on his couch. Tuesday - Don slips out and pawns Helen’s coat - the thing which had first brought them together - in order to buy a gun. She trails him to the pawn shop and finds out from the pawnbroker that he traded the coat for a gun he had pawned earlier. She races to Don's apartment and catches him just before he is about to shoot himself in the bathroom. He tells her their relationship is over, and she glimpses the gun which he has hidden in the bathroom. As they struggle for control of the weapon, she reminds Don of her love for him, and her concern that he should stop drinking. She is able to convince him that ‘Don the writer’ and ‘Don the drunk’ are the same person. He finally commits to writing his novel The Bottle, dedicated to her, which will recount the events of the weekend. He drops a cigarette into a glass of whiskey to make it undrinkable, as proof that he is cured. Wilder was originally drawn to this material after having worked with Raymond Chandler on the screenplay for Double Indemnity. Chandler was a recovering alcoholic at the time, and the stress and tumultuous relationship with Wilder during the collaboration caused him to go back to drinking. Wilder made the film, in part, to try to explain Chandler to himself. The film was intended to have no musical score, but preview audiences laughed at what they considered Milland's overwrought performance, and the studio brought in Miklós Rózsa who wrote an original score for the picture. Upon release, the film was a success. The film's musical score was among the first to feature the theremin, which was used to create the pathos of alcoholism. The film also made famous the "character walking toward the camera as neon signs pass by" camera effect. Rights to the film are currently held by Universal Studios, which owns the pre-1950 Paramount sound feature film library via EMKA, Ltd.
Billy Wilder originally wanted Jose Ferrer for the role of Don, but he turned it down. Charles Brackett's first choice for playing Helen was Olivia de Havilland, but she was involved with a lawsuit that prevented her from being in any film at that time. It has been said that Katharine Hepburn and Jean Arthur were also considered for the role. The film differs significantly from the book by leaving out the novel's noted homosexual overtones, namely the strong implication that Don Birnam, just like the book's author Charles Jackson, is a closet homosexual. The film was a commercial success. Produced on a budget of $1.25 million, it grossed $11,000,000 at the box office, earning $4.3 million in US theatrical rentals. In 2011, The Lost Weekend was deemed "culturally, historically, or aesthetically significant" by the United States Library of Congress and selected for preservation in the National Film Registry. The Registry said the film was "an uncompromising look at the devastating effects of alcoholism" and that it "melded an expressionistic film-noir style with documentary realism to immerse viewers in the harrowing experiences of an aspiring New York writer willing to do almost anything for a drink." At the 18th Academy Awards in May 1946, The Lost Weekend received seven nominations and won in four categories. 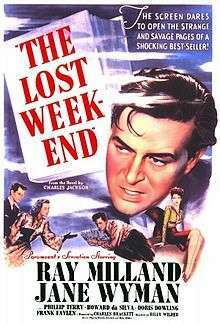 The Lost Weekend was adapted as a radio play on the January 7, 1946 broadcast of The Screen Guild Theater, starring Milland, Wyman, and Faylen in their original film roles. On March 10, 1946, three days after winning the Academy Award, Milland appeared as a guest on a radio broadcast of The Jack Benny Show. In a spoof of The Lost Weekend, Milland and Jack Benny played alcoholic twin brothers. Phil Harris, who normally played Jack Benny's hard-drinking bandleader on the show, played the brother who tried to convince Ray and Jack to give up liquor. ("Ladies and gentlemen," said an announcer, "the opinions expressed by Mr. Harris are written in the script and are not necessarily his own.") In the alcoholic ward scene, smart-aleck Frank Nelson played the ward attendant who promised Ray and Jack that they would soon start seeing DT visions of strange animals. When the DT visions appeared (with Mel Blanc providing pig squeals, monkey chatters, and other animal sound effects), Ray chased them off. "Ray, they're gone!" Benny shouted. "What did you do?" Milland replied, "I threw my Oscar at them!" ↑ "THE LOST WEEKEND - DIARY OF A DIPSOMANIAC (PG)". British Board of Film Classification. 1945-08-23. Retrieved 2013-01-27. 1 2 Box Office Information for The Lost Weekend. The Numbers. Retrieved March 8, 2014. ↑ "Shadows of Suspense". Double Indemnity Universal Legacy Series DVD. Universal Studios. 2006. ↑ "MIKLÓS RÓZSA". International Film Music Critics Association. Retrieved 3 November 2012. ↑ "'Farther and Wilder' by Blake Bailey". Retrieved May 13, 2016. ↑ "All-Time Top Grossers", Variety, 8 January 1964 pg 69. 1 2 "2011 National Film Registry More Than a Box of Chocolates". Library of Congress. December 28, 2011. Retrieved December 28, 2011.